Are you afraid of flying? Korean researchers may have an answer for those who suffer from aerophobia - or at least those traveling to Jeju. The current solution for those with a fear of flying is to go to Mokpo by KTX bullet train, then change to a ferry for a four-hour and 30-minute crossing to Jeju. Korea Transport Institute, a government think-tank, pro-posed an ambitious plan in early January 2009 to extend the KTX bullet train to Jeju, the largest island in Korea. To realize this grand vision, the institute said, it will need to build the longest underwater tunnel ever built. Two small islands - Bogildo and Chujado - located between the Korean Peninsula and Jeju will provide convenient stepping stones for the Korean rail builder that will dig this grand underwater tunnel. The institute said the constructor would first need to build a 28-kilometer bridge over the sea connecting Haenam, in South Jeolla Province, to Bogildo. 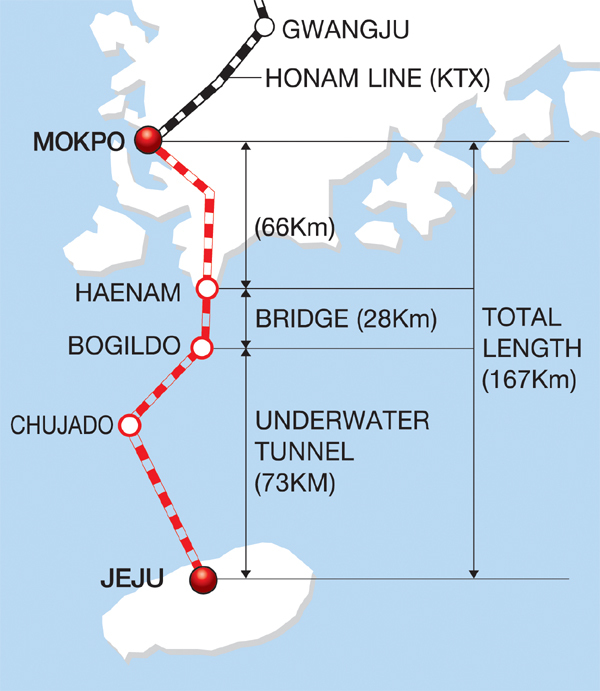 The rest of the line would be completed by digging a 78-kilometer-long underwater tunnel to Jeju, using Chujado as the main drilling station. If completed, Mokpo, the current terminal for the Honam KTX line, would be reborn as a departing station for the extended rail section, which would include the longest underwater railway tunnel. The current record holder is Japan’s Seikan Tunnel (53.85 kilometers) which crosses Tsugaru Strait, followed by the Channel Tunnel between Eng-land and France (50.45 kilo-meters). The institute stressed that an underwater tunnel would enhance the overall economy of the existing Honam Line as it estimated KTX bullet trains would attract nearly 78 percent of those who currently travel by air to Jeju. Some 8.4 million travelers visited Jeju in 2007 and most traveled by air, according to the institute. The journey time from Seoul to Jeju by KTX bullet train would be two hours and 26 minutes, more than an hour longer than by air. However, if you factor in the time required for passenger check-in, security checks and heavy city traffic to local airports, the institute is convinced that a KTX train service would compete well with the airlines. If new and improved KTX trains run between Seoul and Jeju, the journey time would be slashed even more. The commercial cruising speed for KTX bullet trains currently remains around 300 kilometers per hour. The new Korean bullet trains poised to replace the current KTX trains beginning in 2013 will cruise at 350 kph, with top speeds of up to 400 kph. While many train lovers in Korea fondly dream about a fantastic underwater train trip to Jeju, some dissident voices from the island are forecasting gloom for the prospect of bullet trains to Jeju. Many Jeju residents and activist groups fear the potentially negative impact on the island of a sudden and uncontrolled influx of mainland visitors to Jeju by KTX trains. If connected by an underwater tunnel, Jeju will no more remain as an isolated island, they argue, risking the eventual loss of the integrity of its indigenous culture. Those who welcome the project scoff at their concerns, however, suggesting that these are the typical defensive reactions of any insular island culture, and not much different from the early fears of some British about the looming onslaught of European malaise infiltrating through the Channel Tunnel. Another benefit of having KTX trains running to Jeju is that it would slash Jeju’s global carbon footprint dramatically, as the tunnel would inevitably reduce the number of flights from the mainland to the island. Jeju International Airport is already the second-busiest airport in Korea after Incheon Inter-national Airport, with more than 220 daily flights and some 10 million passengers in 2008. The route between Gimpo, Seoul, and Jeju was ranked the world’s busiest city-pair in a recent survey by OAG Travel Service, with 159 average daily flights. Air flight is notorious the world over for its disproportionate contribution to the explosion of global greenhouse gases. One thing is sure, however: As governments around the world struggle to weather the severe financial crisis by investing heavily in building grand national infrastructure, an underwater bullet train system would at least give the Korean government a much-needed excuse to inject a big pile of cash into another of its pet big construction projects - about $10 billion in this case.